Anyone who knows me knows I have a coat problem. Problem might be an understatement; regardless, that makes the below piece self explanatory. Looovee it. 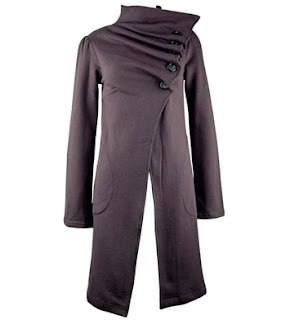 Delicious knee-length Jessie Jacket ($160) from INDIVIDUAL (by I Clothing Co.) is made of super soft cotton fleece. Extra fabric gathers in-between the buttons = extra cute. Dasy Black Navy Striped Jersey Dress ($150 USD) from Diesel. This dress has a wide scoop neckline, half-length dolman sleeves and hits just above the knee. Kind of awesome. 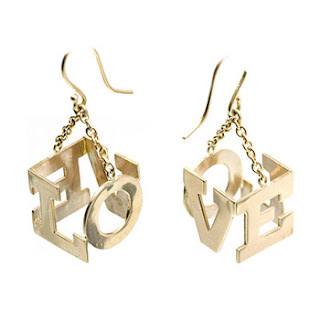 This are kind of cool too; LOVE Earrings . Though for $900- 14k gold, handcrafted by Janet Fraile- they should be.